IBEW Local 569 represents over 3,000 electricians and power professionals in San Diego and Imperial Counties. Our industry relationships, advanced technology and skilled training create dependable quality you can count on. Founded in 1891, the International Brotherhood of Electrical Workers (IBEW) represents approximately 750,000 members working in a variety of fields including utilities, construction, telecommunications, broadcasting, manufacturing, railroads and government. 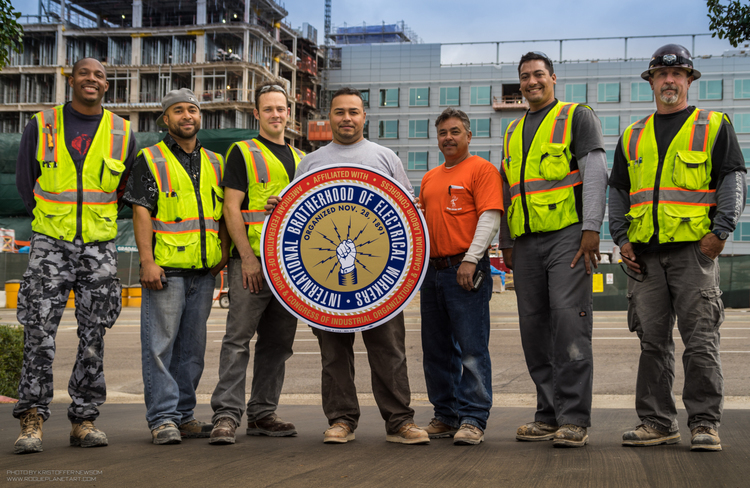 IBEW Local 569 and our contractors are providing good paying jobs and workforce development to strengthen the middle-class and our communities, and we’re mobilizing our members to elect candidates that support working families! We’re also recruiting qualified local applicants to train for an electrical career in the solar, wind and geothermal construction industry. Our electrical apprenticeship is a five year program that includes paid on-the-job training, full family healthcare, a pension and college credits. When finished, an apprentice can eventually become a state-licensed journeyman, earning a base hourly rate around $40 per hour, plus health and retirement benefits. You can earn while you learn, and graduate without any college debt. For more information, visit www.ibew569.org.